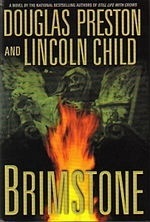 I just finished reading Brimstone by Douglas Preston & Lincoln Child. It is the 5th book in their Special Agent Pendergast series. It is also the 1st book of the Diogenes Trilogy. This book centers around Pendergast and his investigation of a murder with possible Satanic connections. This was definitely my favorite book of the series so far. The mystery at the center of the book kept me guessing. Special Agent Pendergast is inspired by Sherlock Holmes and it shows in this book. His Watson is Sergeant D’Agosta. The chemistry between these two friends/colleagues is what makes this book so great. They haven’t been teamed up since the 2nd book in the series, Reliquary and it was great to see them interact again. Pendergast is the star of the novel. This is the first book to give us a true glimpse of the character’s life. Five books into the series and Pendergast is still somewhat of a mystery. That’s what keeps me reading these books. You learn a bit more about him in each book. The central mystery of this book is really great. This book is the perfect example of a page turner. Every chapter ends with a punch that insists you keep reading to find out what happens next. Preston & Child definitely know how to build suspense. This book is also richly detailed, which isn’t really a surprise because Preston & Child are known for their extensive research. The book is very descriptive but the pacing doesn’t suffer; the story moves along briskly. The only weak spot to be had is a subplot involving a vagrant street preacher. Whenever the story focuses on him, the story starts to drag. He may be an important character in a later book and this may be how he’s introduced into the world of Pendergast, but it didn’t gel with the rest of the story. His story just felt flat and unnecessary. As I said, this book is the first in the Diogenes Trilogy. Diogenes is Pendergast’s mysterious (surprise) brother and it seems like he is going to be the Moriarty to Pendergast’s Sherlock. I definitely am looking forward to see where the story goes from here. The book definitely leaves you wanting more. The next book is Dance of Death. It’s not the next book I’m reading but I’m definitely reading it soon. To anyone who hasn’t read any of the Agent Pendergast novels, start at Relic and work your way up. You will enjoy the ride. Next off the shelf is Abraham Lincoln: Vampire Hunter. Read my work and hire me.